It's always fun to show visitors around; it gives me a reason to go out and about. Beijing Pan Am International Aviation Academy (2006) had a lot of characters and from time to time we meet in our travels. 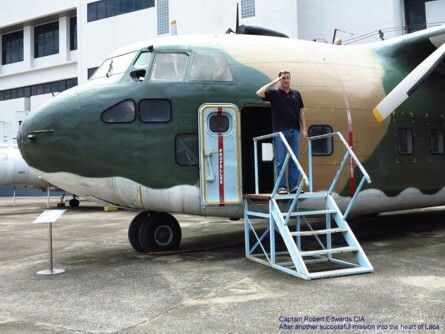 I picked Robert up in the little car and took him to the RTAF museum, always worth a visit... A good day out. 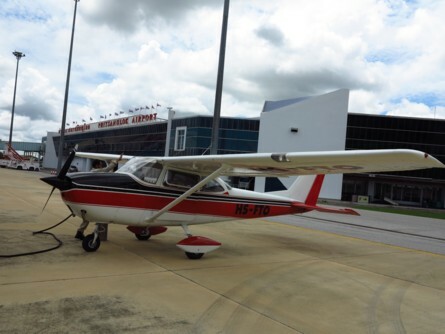 The DCA - CAAT bought a new Cessna 172S last year, it showed 58 hours running time on the G1000, most of it ground running time. I went to look at it as it was put up for auction. "Time to spare, go by air"
It's always dodgy flying a light aircraft anywhere as the weather can change and keep you on the ground. I know this... A further problem was the fact that I needed to catch an airline flight in two days and so it would be dodgy for me to be flying back up north the day before... I weighed the risks, including the fact that I thought I had arranged for a pilot to fly with Walter back to Nok; it turned out I didn't. It was a poor decision on my part. I do try to do the best for my clients, and so with the risk of inconvenience considered we took the Cessna down to Don Mueang. Flying the Cessna 172G to Phitsanulok we climbed high and it was an easy flight. Phitsanulok has Avgas and so it's common to stop there when flying North and South. On arrival we sighted a Turbo 3 doing circuits and followed it in to land at 11:44 after 1 hour 31 minutes in the air. From Phitsanulok we aimed to a point west of the military training airfield of Takhli as I know they prefer this routing. 25nm from Phitsanulok I called Focal Military and was told to "Radar monitor". As we approached the Takhli zone Focal told me to call Takhli... I tried many times, and finally told Walter to start an orbit just clear of their airspace. I called Focal again, and after a pause they told me to call Takhli again. Still no joy, and so I told Focal of our predicament, we should not enter controlled airspace without a clearance. "Standby", Focal came back with a clearance to fly west of Takhli. 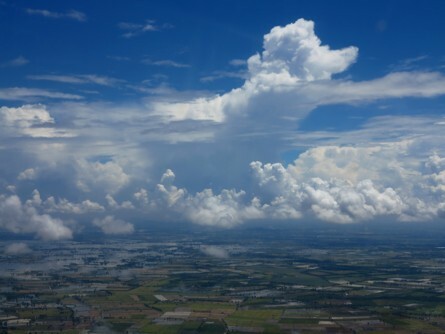 South of Nakhon Sawan we met a Cb, Cumulo Nimbus cloud, dropping heavy rain. Cbs are common this time of the year, and some are really nasty. It was easy to divert a little to the right and fly around this Cb in the clear, but I did consider my options for diversion if there were more Cbs on my route such that it would be impossible to continue to Bangkok. As it was, the route was clear through to Don Mueang except for an area filled with smoke from the pyromaniac fires below. We followed the routing via Ayutthaya to 5nm West, and then into a holding pattern on the right downwind while ATC waited for an opportunity to fit us in between the stream of A320s and 737s. Landing was at 15:00 after 2 hours and 5 minutes in the air, MJets crew were there to meet us, and we tied the aeroplane down. The people I had hoped would be able to fly back with the aeroplane were unavailable to do so. It's difficult to find pilots these days! 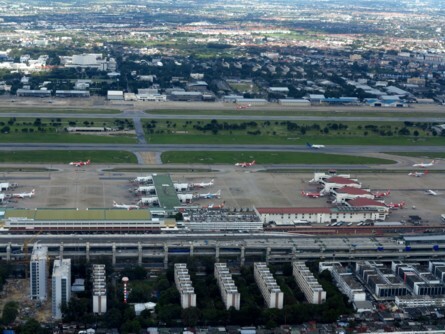 So it was for me to fly the aeroplane back the next day which would be risky business when I was booked on a flight from Bangkok the day after. The next morning began with low cloud and poor visibility, and Phitsanulok was forecast to be IFR until Thursday... The aeroplane could not go anywhere, and it was my responsibility. It was recovered by someone later, and so I suppose I have a bill to pay. The last time I flew the Thai Airways - Air Canada journey to Hong Kong and then to Vancouver, there was a dramatic difference in service standards between the two airlines. Thai Airways cabin service is excellent most of the time. This time Air Canada was not bad, a big improvement on the last time I flew on this route with them. 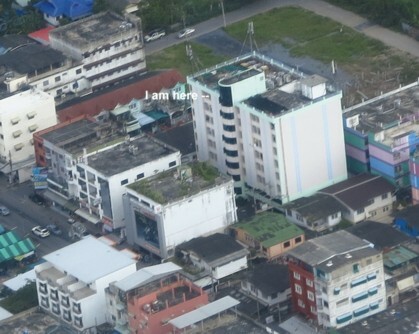 We arrived on time in the afternoon of the same day we took off from Bangkok after flying across the International Date Line, and picked up a rental car to drive to Langley. Rental cars always have additional costs in North America. I dislike renting here, while I have no qualms renting in Britain and Thailand... We were slaped with a load of tax when we returned the car. The rental company would not accept my BC driving licence, I once again had to use the (Temporary) Thailand Driving Licence. I don't mind early mornings and jet lag will often mean waking up early, so the next morning I walked to the hangar, pulled the Chipmunk out, turned its prop to circulate oil, and gave the engine a run. The batteries were still good, allowing the starter to turn the prop easily. 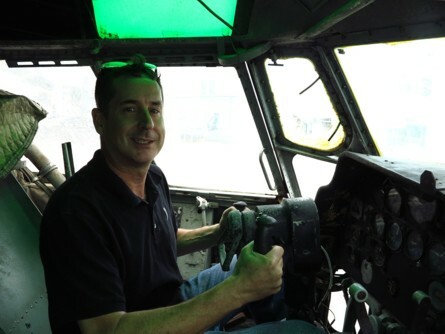 The objective of this trip was to show Daren (builder of the RV9A here in Thailand) around and to do some flying. I was partially successful in this, but forest fire smoke was to thwart my plans. 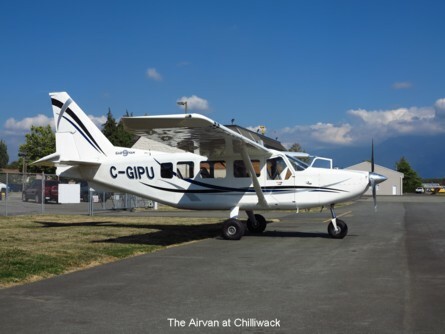 The Airvan had not flown since I flew it in April, and has just had an annual check, so we gave it a run up the valley to Harrison, and then into Chilliwack for lunch. 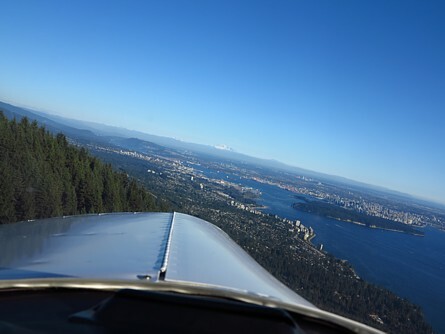 We flew back to Boundary Bay with a touch and go at Abbotsford on the way. 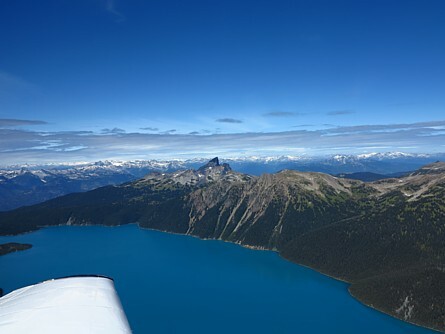 The next flight was in the Piper Warrior from Boundary Bay up the Pitt River Valley, over Garibaldi Lake, and as far as Blackcomb before flying back to Squamish.This journey is spectacular in its scenery. We are very lucky to have the freedom to enjoy flying like this. 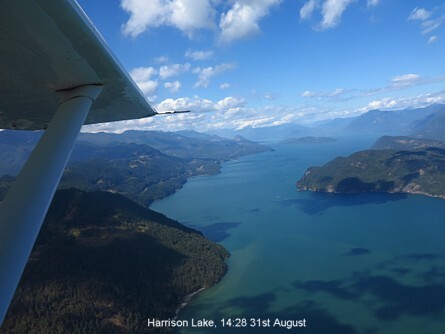 The return flight was down Howe Sound to fly over Vancouver, along the Fraser River, and back into Boundary Bay. 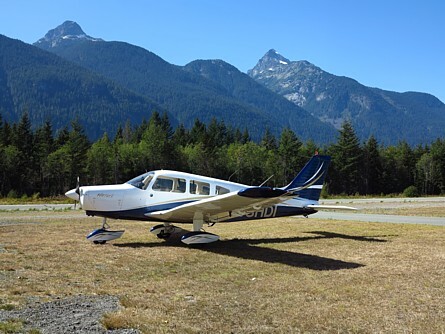 There is a serious lack of instructors in the Lower Mainland, and during this trip I had many offers of employment, but my time here is finished. I'm 63 and I want to find a place to be content in my old age. When I age and lose my medical it will be a lonely disaster if I stay in BC; I won't have money to live, to travel, and it will be very uncomfortable. So I will visit from time to time. I did have 'Michael' things to do on this trip, but I am obliged to be there to make the trip a good one for Daren. One Michael thing was to go and fly with Bill in the Volmer Sportsman to do circuits, and so I did this early in the morning so as not to affect my day's obligations. (4th September). 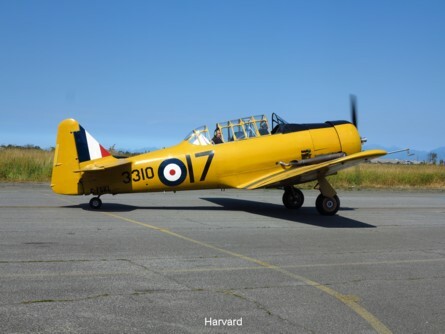 My brother Gary organised a jet flight for Daren later that morning, and then Trevor arrived and gave him a ride in the Harvard. 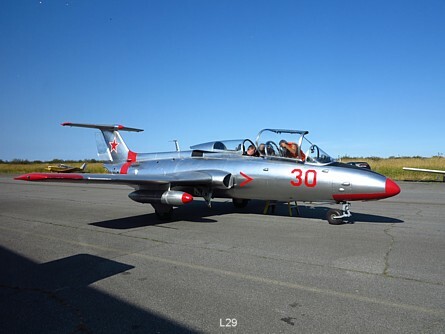 The plan was to fly to Wetaskiwin in Alberta the next day, but smoke from forest fires blotted the sky for the next three days. 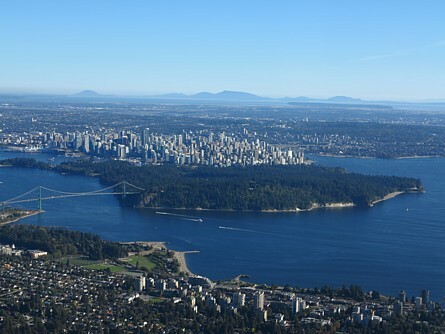 Instead, I took Daren downtown to see the seaplane operations on Vancouver's waterfront, and then to Vancouver Airport.